Summer’s here, and before you know it, it will be the Fourth of July. This holiday brings with it much excitement and anticipation, but it may actually be something you are dreading this year. Not because of the barbeque, patriotism, or red, white, and blue decorations, but because of the fireworks. For many dog owners, the Fourth of July is a source of stress because the loud fireworks give their pets extreme anxiety. No one wants to see their pup scared, but it can be a more serious issue than just a trembling pooch hiding in the bath tub. Every year, dogs decide to flee from their homes during the fireworks show, seeking safety but actually putting themselves in more danger. If your pooch is the anxious type, it is important to take steps to help them stay calm during the festivities. With the right preparation, you can prevent your dog from having an extreme reaction to fireworks so you can both enjoy the holiday more. You can and should start preparing your dog for the fireworks now. You can start by introducing your dog to the sound of fireworks now. Play a sound recording of fireworks on low every evening, then continue to slowly raise the volume over time. With time, your dog will get used to the sound, and will probably be much less anxious about them when Independence Day rolls around. Additionally, you may need to bring your dog into the veterinarian before the holiday so you can acquire a calming medication for your furry friend. Many dog owners hesitate to use sedatives on their dog, but sedating your animal may be the best solution for keeping them safe on the Fourth of July. If you come into our vet hospital in Idaho for help, we can determine which medication is most appropriate for your pet. There are many options ranging from mild sleeping aids to benzodiazepines. Whatever we prescribed, we will make sure it is the best for your pet to ensure they keep calm this Fourth of July. On the big day, you should set your dog up for success by getting them a lot of exercise. This is a good day to take your pooch for that hike you have been talking about, to the dog park, and/or just on several long walks. When your dog is tired, they will be more likely to be calmer during the fireworks because they will be too exhausted to be bothered. Next, make sure to never take your dog with you anywhere to watch the fireworks. This is a problem because it makes it much easier for your dog to run away and far more difficult to be found should they panic and run. Keep your dog inside during the fireworks, ideally with a human and air conditioning. There are also steps you can take to ensure the environment feels safe to your dog. When feeling anxious, your dog may feel safest in an enclosed space, and therefore, may hide in the bathroom or closet. You might crate your dog, if that doesn’t cause them more anxiety. You can also close the blinds and curtains so that your dog won’t be visually stimulated by the fireworks. If you are leaving the dog alone, make sure to give them something entertaining to distract them, such as a Kong toy stuffed with their favorite treats. Additionally, turn on some calming music to help your dog relax while you are off enjoying the festivities. There is actually music designed to calm dogs that may help! It is designed to physically calm a dog’s nervous system, so play it quietly before you leave the house (keeping in mind that your dog’s hearing is much more sensitive than yours). 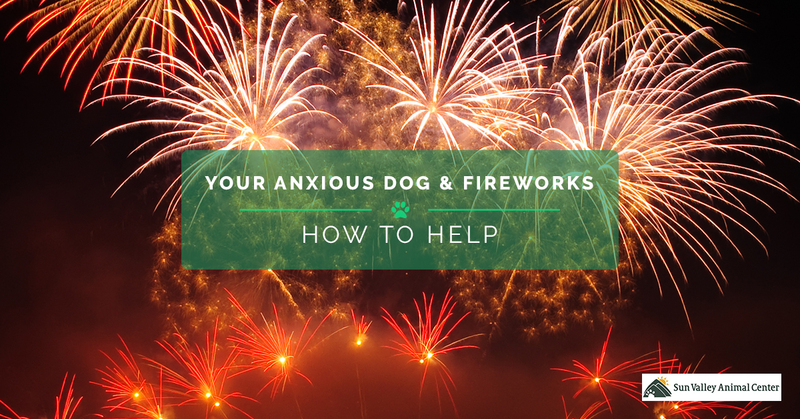 You never want to see your dog distressed, but fireworks can cause canine (and human, for that matter) anxiety. Fortunately, if you take these simple steps, you are way more likely to have a calm pet during the Fourth of July than a scared one. If you need to make an appointment to take your pup into our veterinary hospital before the Fourth, contact us today!